Pittsburgh Steelers quarterback Ben Roethlisberger smiles as it is announced that he became the first quarterback in NFL history to throw for over 500 yards in a game twice in his career. There have been weeks when the Hacker Gods1 have read my words and, out of spite, scorn or general ambivalence, gone out of their way to prove my alleged insights wrong. This was not one of them. What a week for quarterback box scores! Perennial Skeptical Football muse Peyton Manning kicked things off last Thursday night with 286 yards, 71 percent passing and three touchdowns in the Denver Broncos’ win against a strong San Diego Chargers team. But by the end of the Week 8, his 124.2 passer rating was only sixth-best. Leading the way was Ben Roethlisberger, who had six touchdowns and 522 yards for the Pittsburgh Steelers, completing 40 of 49 passes. Tom Brady pulled the “as many touchdowns as incomplete passes” trick with five TDs and 354 yards, completing 30 of his 35 passes for the New England Patriots. And then Kyle Orton had a monster throwback performance with four TDs and 238 yards on just 10 completions and 17 attempts for the Buffalo Bills — a surprising powerhouse halfway through the season. ESPN Stats and Info tweeted that Roethlisberger’s 99.0 Total QBR was the highest in the history of that stat2 (which, unlike passer rating, has no specific maximum value — a quarterback can only get closer and closer to 100). So naturally that got me wondering how these games stacked up historically, which prompted me to, naturally, put every QB game ever played3on one chart. 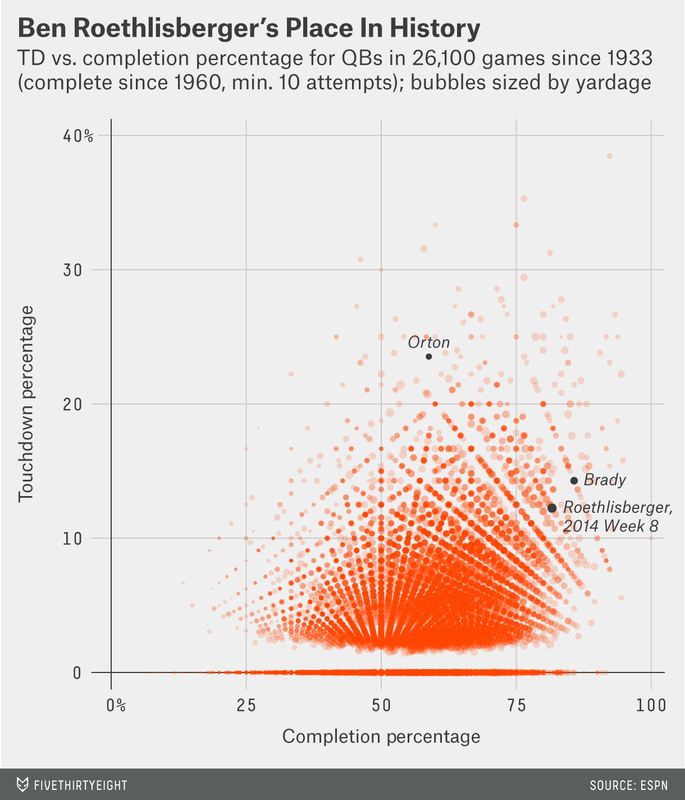 Each bubble represents one of the 26,100 games in which a QB had 10 or more attempts. The x-axis and y-axis are completion and touchdown percentages, respectively. 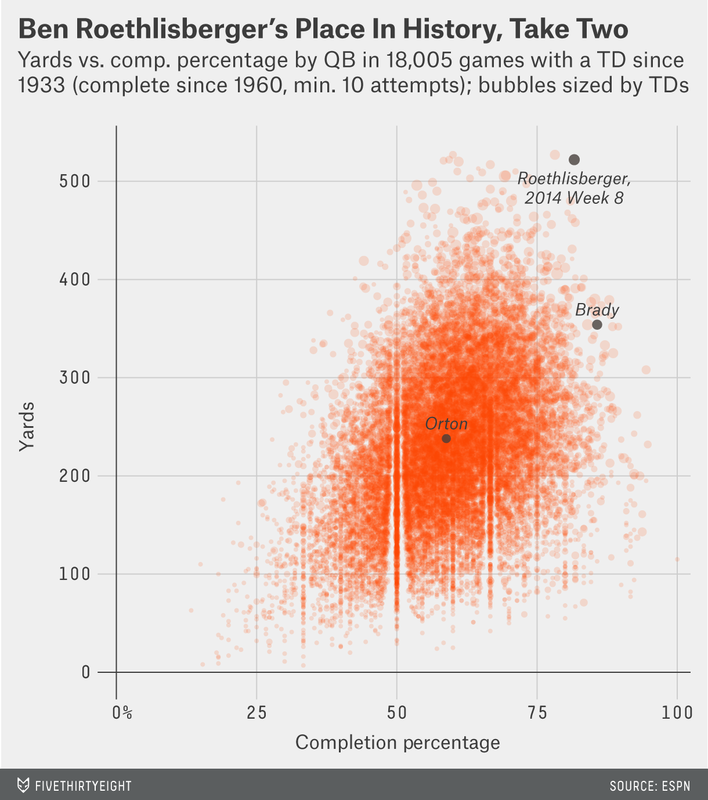 The size of each bubble corresponds to passing yards. That dot out there in the upper right is Frank Ryan, quarterback of the NFL champion Cleveland Browns, who, on Dec. 12, 1964, went 12 of 13 for 202 yards and five touchdowns. On efficiency alone, Roethlisberger or Brady’s games don’t come close to that. On the other hand, Roethlisberger’s performance stands out for its size, as well as its efficiency. It’s tied for the third-largest bubble on the board (522 yards). To put that in perspective: If a quarterback started a game with Ryan’s epic 12-of -13, four-TD performance, matching Roethlisberger would still require going 28 of 36 for 320 yards and one TD after that. Hartline’s question is tougher to answer than you might expect. There are three things to love about Mettenberger’s performance: 1) He was in the game. 2) He threw for lots of yards. 3) He tallied two TDs. These are all things that predict success for rookie QBs later in their careers, and Mettenberger’s stat line is fairly rare for rookies, who have thrown for 299+ yards and 2+ TDs only 70 times before. However, late-round picks who are pressed into action early (like Mettenberger) are a rare species, and successful ones are even rarer. But those are the cream of a very large crop. Two hundred ninety-three quarterbacks have been taken in the sixth round or lower, and just 21 of them had minimally “successful” careers (which I define as a career Approximate Value of 32). Of 97 players drafted in the sixth round like Mettenberger, only nine were “successful.” Thirty eight of those sixth-round picks played in their rookie years, 22 of whom reached 45 career attempts and four of whom were “successful.” Those four include Brady, who has given sixth-round picks everywhere hope — but he only played a few snaps in his rookie year. “Successful” late draft picks who were pressed into action their rookie year include the likes of Don Majkowski, George Ratterman, Rodney Peete, Gus Frerotte and Ryan Fitzpatrick. Not the most illustrious list, but when it comes to late-rounders, there’s not a lot of data to go on. The Jacksonville Jaguars’ Blake Bortles had two interceptions returned for touchdowns in Jacksonville’s loss to the Miami Dolphins. Good thing we don’t care about interceptions! The Oakland Raiders’ Derek Carr is somehow putting up decent numbers for an 0-7 team that, with Seattle, Denver and San Diego coming up, is probably going to start 0-10. As I’ve said before, the Raiders are like the Patriots of losing. Carr had 328 yards in a loss against a Browns squad that did not feature Johnny Manziel. The Minnesota Vikings’ Teddy Bridgewater scored a victory over the Tampa Bay Buccaneers, throwing 240 yards and one TD. Jimmy Garoppolo at least made it into the game, and went 3 for 3 in garbage time against the Chicago Bears. Even the slightest hint that Brady is a system quarterback is good news for the person most likely to inherit the system. Also, he still leads all rookies in NFL Passer Rating. Zach Mettenberger had a promising debut, as discussed. Johnny Manziel did not play. 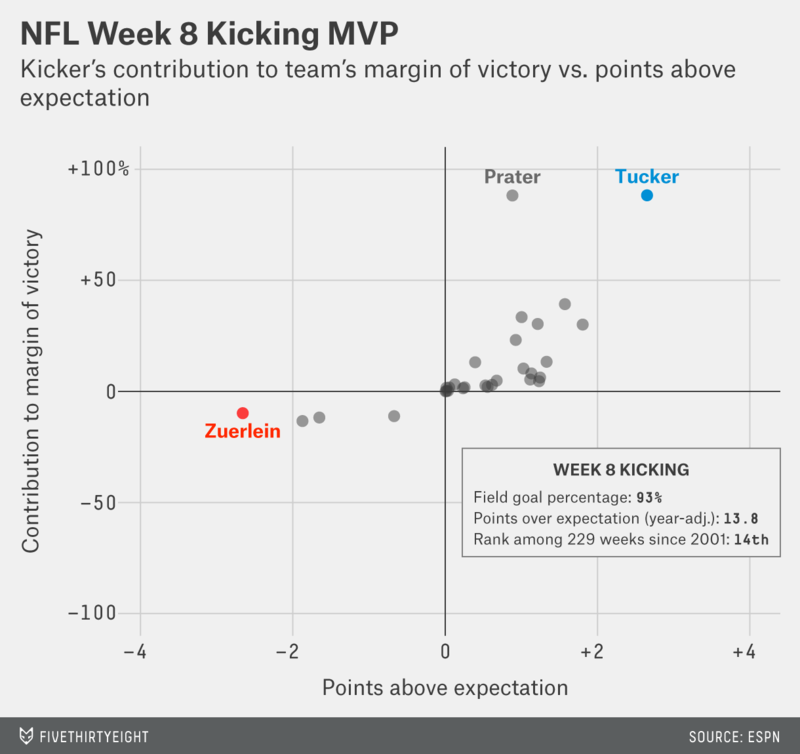 Greg Zuerlein of the St. Louis Rams is the goat this week, though he didn’t hurt his team’s chances very much (no kicker did). Zuerlein takes the award because he missed a 38-yard attempt. Congrats, you’re the (read: my algorithm’s) least valuable kicker of the week! For most valuable kicker, Matt Prater was a strong contender, hitting the game winner for Detroit in a game the Lions won by one point. But the best performance came from the Baltimore Ravens’ Justin Tucker, who made kicks of 45, 50 and 53 yards. Just two weeks ago, I mentioned that Tucker, Blair Walsh of the Vikings and Dan Bailey of the Dallas Cowboys represented the next generation of great kickers, and now they have back-to-back-to-back MVK awards to show for it. DeMarco Murray is having a record-breaking season so far, so I was surprised when I pulled up his efficiency stats (I’ve written about Murray’s running profile myself). Murray, despite starting the season with eight 100+ yard games on a 6-2 Cowboys team hasn’t been among the top win- or point-generating backs in football this year. He has a Win Percentage Added per attempt of 0.14 percent (12th-best in the league for running backs with 50+ attempts) and an Expected Points Added (EPA) per attempt of .03 (10th-best, less than a third of perpetual badass Jamaal Charles’s). Fumbles have an enormous effect on WPA/EPA stats despite having extremely high variance. This is an inherent danger of stats that measure actual results — no matter how accurately they do so — rather than trying to predict performance. They can be greatly affected by things that aren’t predictively reliable. 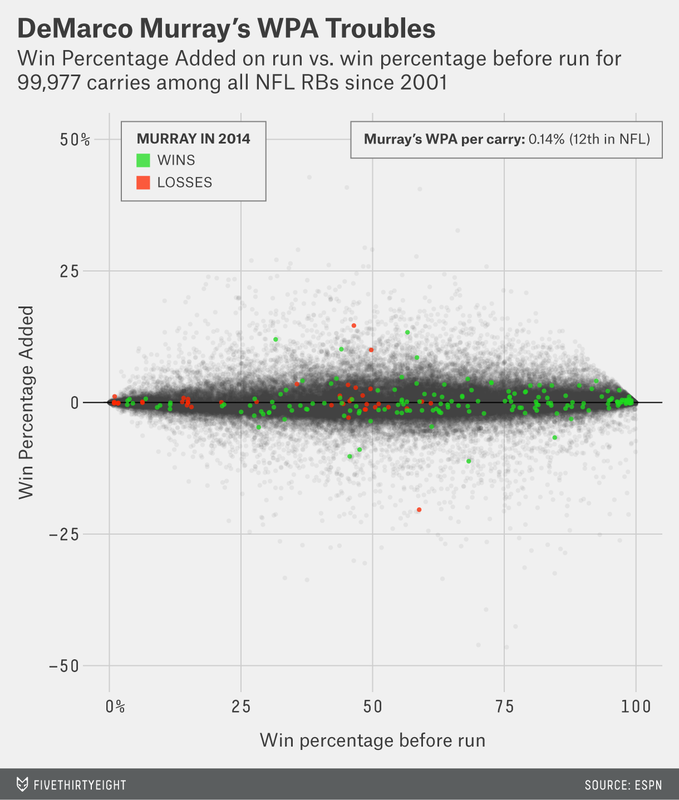 In general, solid predictive stats in the NFL are extremely rare relative to other sports. Two familiar faces for Skeptical Football found themselves in deep holes Week 8. I’ve previously written that Aaron Rodgers may be too cautious in comeback situations, maintaining a low interception rate but not maximizing the Green Bay Packers’ chances of winning. Then he threw two interceptions in a losing effort against the New Orleans Saints. He threw his first interception with the game tied 16-16 (5 yards downfield on a third and goal). Then he threw another interception (thrown 6 yards downfield on second and 15). But what bothered me more was, with 9:51 left and down 21 points, he led the Packers on a 4:44-long touchdown drive in which his deepest pass was a 14-yard bomb — on first and 20. These short passes suggest Rodgers was taking what the defense gave him, which is great quarterbacking strategy in most situations. But when a QB is down three touchdowns, he needs to take risks and throw downfield into double-coverage every once in a while. In other words, Aaron Rodgers is not my Gunslinger of the Week. The Gunslinger award goes to … Matthew Stafford. Again. I featured him in last week’s column, and now he put up another impressive comeback (from 21 points down this time) in London against the Atlanta Falcons — in which he threw another downfield interception while trying to bring his team back. How did he do it? Throwing deep. His first touchdown pass was on a pass thrown 58 yards from the line of scrimmage. His second was set up by a pass thrown 30 yards downfield. The game-winning field goal was set up by passes 23 and 19 yards downfield — each on first down. 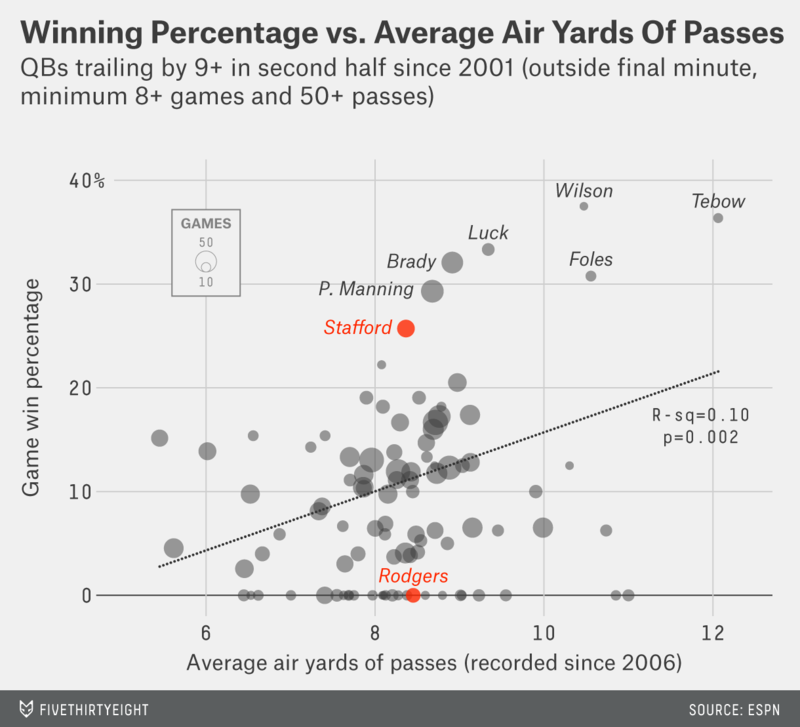 Recent history notwithstanding, Stafford and Rodgers are pretty similar in this area. In comeback situations, the overall relationship between the average yards each quarterback’s passes travel in the air and their win percentage is positive7. I should note that Rodgers throws downfield less when behind than he does normally, whereas Stafford throws downfield more when he’s behind than he normally does. This is consistent with the theory that Stafford is better at adjusting his game to comeback scenarios. But being a good gunslinger and being a good QB aren’t perfectly correlated. There are some skills (i.e. the high-risk, high-reward ones) that suit the comeback scenario well but may not work as well in normal situations. Tim Tebow, for example, threw even further downfield on average in non-comeback situations despite throwing the furthest downfield in comeback situations by a wide margin. He had a great record at comebacks but was not a great quarterback — perhaps, in part, because he was chucking it too much under normal circumstances. The goal of gunslinging isn’t to win a high percentage of comeback games, but to win more than 15 to 20 percent of them. It’s more of a special case under the broader taxonomy of “clutchness” — a concept overvalued by the broader public but probably undervalued by the stats community — which is all about phenomena involving a divergence between win-maximization expectation and point-maximization expectation. It’s not about magic or mumbo jumbo. It’s about winning. Whom am I kidding? It’s Manning vs. Brady. As I’ve said before, the two most powerful forces in the history of football are probably Peyton Manning and Bill Belichick/Tom Brady (whichever of them is responsible for New England). Naturally, it’s always exciting to see these forces square off against each other, and every time we learn more about how the best go about their business. Not to be confused with the Football Gods. The Football Gods impart divine punishment and reward as a matter of justice. The Hacker Gods just like to mess with us. Which, granted, only goes back to 2006. OK, not necessarily every game. Every game back to 1960, plus playoff/championship games back to 1933. Those nine FGs from 50+ yards is tied for fourth-most in a week since 2001. In Week 2 of 2012, teams made 54 of 57 field goals, including 10 of 11 50+ yarders (and hit all 83 extra points). That’s 22.5 points above expectation, or about .40 per kick. Murray also has a -10 percent play from a routine failure to pick up a third and 1 in a late-game situation against St. Louis when Dallas was down four points. High leverage, high-variance plays like this have a huge impact on a player’s WPA and probably an outsize effect on EPA. R-squared of .10, t-value of 3.1.